This is Part I of our PCH Road Trip series. You can read Part II (Oregon) here or Part III (California) here. It can be argued that no US road trip would be complete without a drive on the Pacific Coast Highway (PCH). This quintessential west coast trek was high on our bucket list and we couldn’t wait to cross it off. Our route began close to the tip of the Washington Peninsula (just outside of Forks, WA) and ended 10 days later in Los Angeles, CA. Disclaimer, we would highly recommend allowing more than 10 days for this drive, if possible. After three amazing months, our Great Canadian Road Trip came to an end and we crossed the border belting our National Anthem (true story) and immediately headed west. Our starting destination was Washington’s Olympic Peninsula. The peninsula is home to Olympic National Park which includes the rugged Olympic Mountain Range, as well as hundreds of miles of coastal rainforest and the famous rocky coastline of the Pacific Northwest. Since we’d spent a night in the northern part of the peninsula at the start of our trip, we decided to head straight for the coast to kick-off the journey. We were welcomed to Olympic National Park with torrential downpours and the famous PNW fog that settled eerily on top of the trees. So naturally, the first stop of our road trip made the most of the rain! 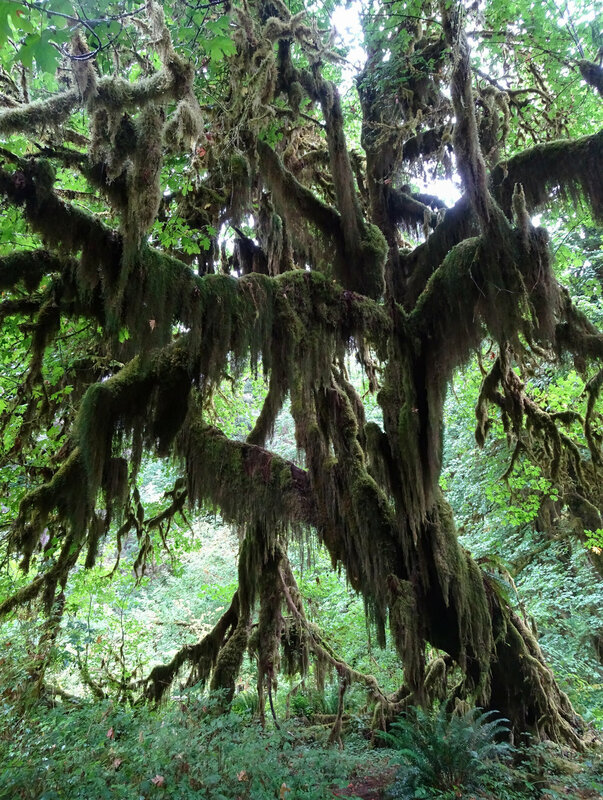 The Hoh Rainforest is in the heart of Olympic National Park (about an hour inland from Highway 101) and offers various hiking trails to explore the wet, lush, and dense forest. We had considered backpacking a portion of the Hoh Rainforest trail – a 26-mile out-and-back trail through the rainforest and a glacier. 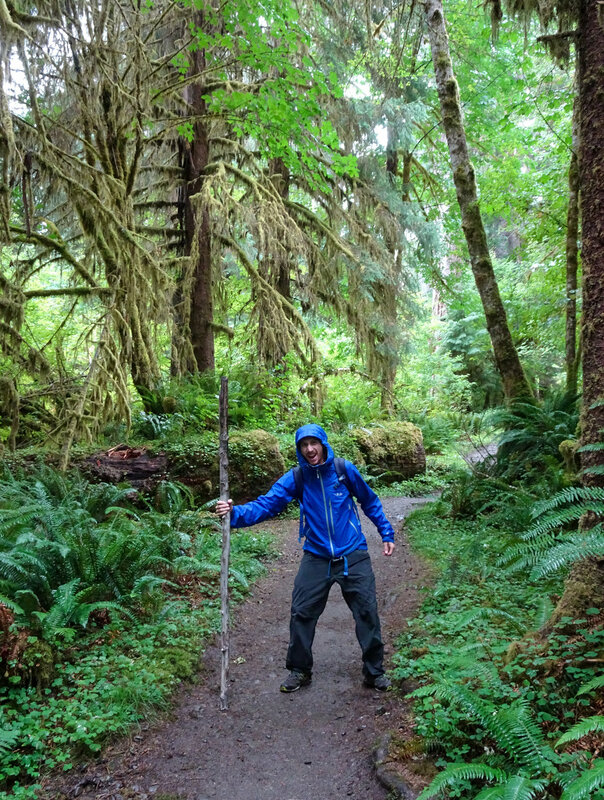 Unfortunately, our 10-day timeline limited us to day-hikes (see disclaimer above) so we stuck to the interpretive trails and took our time exploring the soaking wet trees, plants, and animals of the Hoh Rainforest. There is a campground near the Hoh Rainforest Visitor’s Center if you plan to stay for more than one day, but our plans led us back to the coast so we could get up and explore the famous beaches the next morning. Thanks to the weather we had no trouble finding a campsite that night, but if you visit the National Park during peak season, expect the campgrounds along the coast to fill-up quickly, even on a weekday. 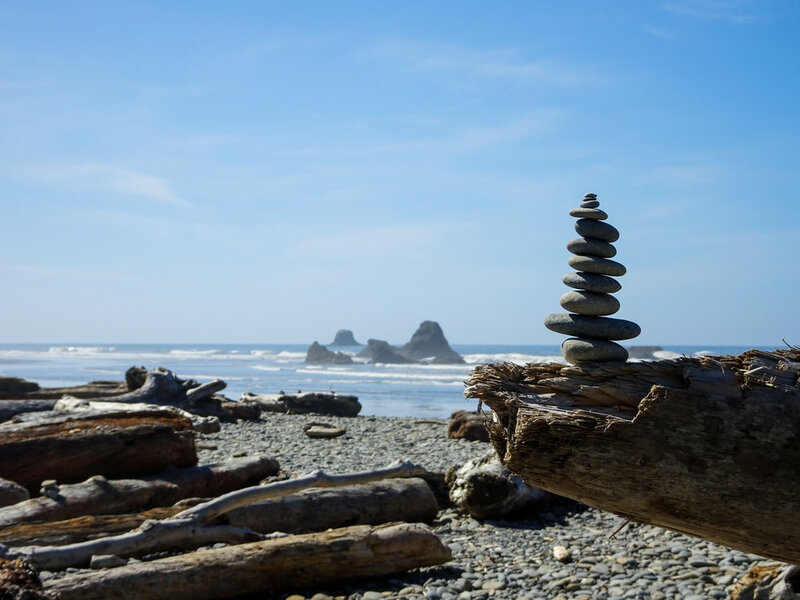 We spent the next day driving up the Washington coast to check out the famous rocky shores of Ruby Beach and the many beaches near La Push, WA. If you’re a Twilight fan, you’ll recognize La Push as Jacob the werewolf’s hometown, and Forks (the largest town on the northern Washington coast) as Bella and Edward’s stomping grounds. This fantasy series is the town’s only claim to fame and, aside from various Twilight gift shops and film tours, there really isn’t much else there. 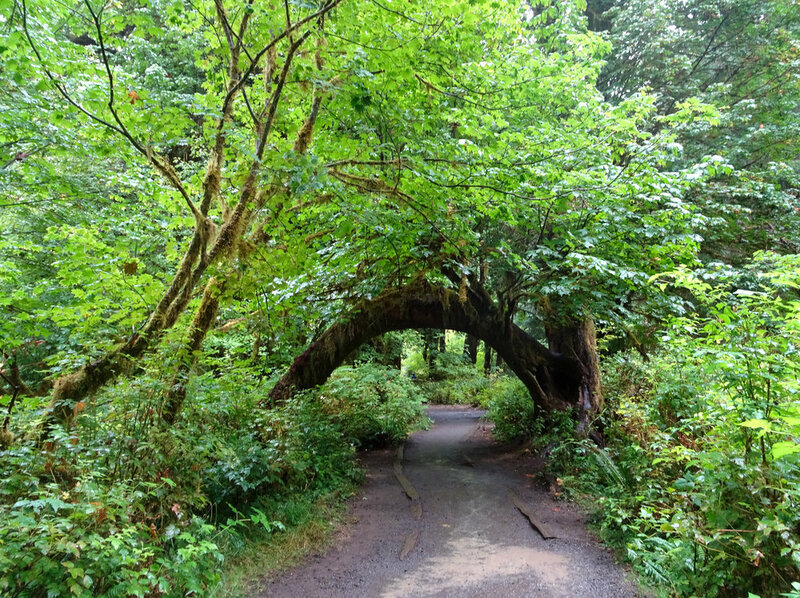 As an old fan of the books (let’s not talk about the movies) I’d recommend a stop in Forks to check it out, but Olympic National Park is far more enticing. We hit Ruby Beach first which is arguably the most famous beach on Washington’s northern coast. Ruby Beach, and many of the beaches in Washington, Oregon, and Northern California, are known for the giant sea stacks that line their shores. Sea stacks are enormous rock formations that have eroded from the mainland and appear to grow directly up from the sea. We’d seen pictures of the rocky shores, but I don’t think anything can prepare you for the shock and awe of seeing these monstrous formations in person. Sea stacks are also home to various bird species, so it’s a treat to explore up close and watch puffins, gulls, and a variety of sea creatures around the rocks. After a couple hours on Ruby Beach we headed north toward La Push to check out Rialto Beach. The beaches in Washington have a lot driftwood washed up on their shores including massive spruce and fir trunks brought in with the tide. We spent some time climbing around the dead trunks on Rialto Beach and soaking in the rare PNW sun that stuck around for the day. Fair warning, Rialto Beach is not a sandy beach so sunbathing is out of the question, but a picnic along the shores is not. In La Push, you can camp along the coast in various spots at Third, Second, and First beach (the locals got very creative with the names). Just pack up your gear, hike a few miles (or more) and set up shop. Since our timing limited us to car camping, we decided to at least hike the short distance out to Third Beach and check out the scene. The easy one-mile hike to the beach wove through a lush forest and had us feeling like we were miles away after just 20 minutes of walking. We ended up having that feeling a lot on the coast of Washington. If you find yourself near La Push, add a night at Third Beach to your list – you won’t regret it. The next morning, we hit the road early to cover some ground on our way down to Oregon. Luckily, Highway 101 took us right through South Bend, Washington, aka “Oyster Capital of the World.” Apparently one out of every six oysters consumed in the US are farmed in Willapa Bay in South Bend. So, of course, we stopped at the first oystery we could find to shuck some ourselves. What Goose Point Oysters is lacking in curb appeal, they more than made up for in their “shuck-your-own” experience. There were enough cars parked outside the warehouses (which we later realized were employee cars) that we stopped in and wandered around looking for the shop. We appeared lost enough for an employee to help direct us almost immediately. 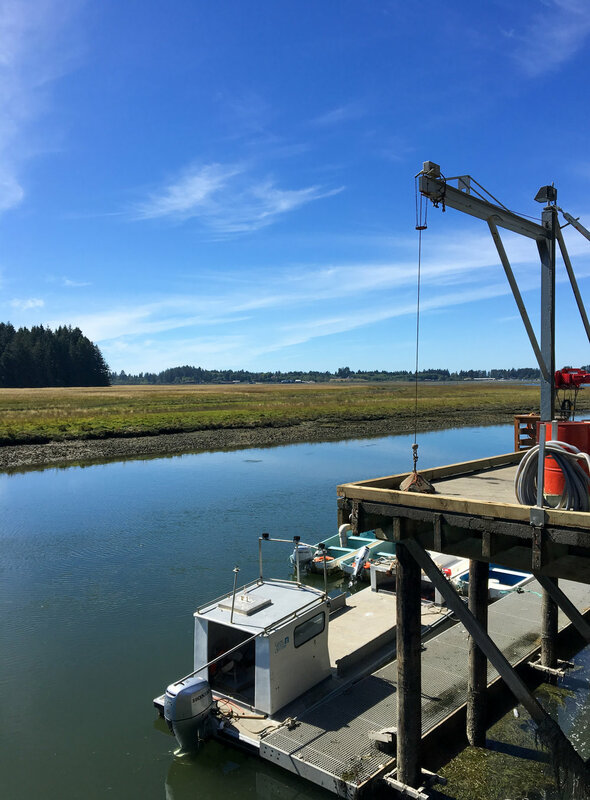 The shop is located around the back of the warehouse and features a well-stocked oystery overlooking the stunning Willapa Bay. After browsing the merchandise, we purchased a dozen medium oysters and got to shucking. One dozen won’t fill you up, but Goose Point Oysters is the perfect pit stop for an afternoon snack and an out-of-the-ordinary experience. Plus, the view from the deck couldn’t be beat. Just before we hit Oregon, we began to see signs for “The World’s Longest Beach,” aptly named Long Beach. After visiting the world’s oyster capital, we figured we might as well visit its longest beach as well. To our surprise (and Derrick’s delight), we learned you could drive a 4x4 vehicle on Long Beach and Derrick excitedly floored it down the coast. Speeding our Jeep past beach goers and families walking their dogs was a pretty fun, if not strange, experience. If driving on the beach isn’t your thing (or you don’t have the vehicle for it), the town of Long Beach is a quaint little seaside spot that would be the perfect lunch and/or shopping pit stop before crossing state lines. If you plan to trek the Hoh Rainforest Trail, we’d highly recommend you camp in their established campground on-site the night before you set out. Even if you’re just day-hiking, this campground is a great basecamp in the National Park. However, staying inside the park means remote camping with amenities like grocery stores and restaurants at least a half an hour drive. Since we planned to explore both the rainforest and the coast, Derrick and I opted for a campground just outside of the National Park boundary. Hoh Oxbow is a first-come, first-served (FCFS) campground located just off Highway 1 near the rainforest turn-off. For $7/night, it was the perfect place to pitch camp. However, there are plenty of FCFS and reservable options along Highway 101 on the way up to Forks, including campgrounds right along the beach. Of course, these sites fill-up fast, so reserve ahead of time or arrive early enough to get a spot right after check out. You can read our tips for finding campsites here. After spending a full day exploring the gorgeous Washington beaches, we decided to camp on one that night. If you want to camp on the beach, be sure to arrive early to secure a spot as we found most beach-side campgrounds were full by mid-morning. Luckily, we arrived at South Campground on a Sunday morning so we had our pick of spots near the beach. Full disclosure, South Beach Campground is a glorified RV Park so the digs are not luxurious, but this also means plenty of “spots” to choose from and makes this campground a good option when others are full. Not to mention, South Beach Campground is located right above the beach which offers spectacular views and stunning sunsets! We even got to see whales swimming less than 50 yards off the shore just as the sun was setting. We were happy campers ;). This spot is more of an option than a recommendation and only landed on this list since it’s a free place to stay in a convenient location. When we arrived in Oregon, we had plans to camp at Fort Stevens State Park but quickly learned the campground was full. Again, we’re not the best at planning ahead. With few alternative options, we decided to drive back across the border to Washington and parked our car at a temporary overnight rest stop called Dismal Nitch. As we learned from the informative placards at the rest stop, Louis & Clark were marooned at that very spot for six days by a storm on their journey west. They were mere miles from their destination and had to endure cold, wet, torrential downpour with little food or shelter. It was the only time throughout the entire journey that Clark thought they may not make it, and the rest stop featured various snippets from his journal where he referred to that little slice of shore as Dismal Nitch. Luckily, the modern-day rest stop was not dismal at all and featured better views than many of the campgrounds at which we’d stayed throughout the rest of our trip. Granted we were parked next to various other wayward travelers so privacy was non-existent, but our one night at a rest stop was not nearly as bad as I’d imagined it would be. If you find yourself without a place to camp on the Washington-Oregon border, Dismal Nitch is a free and surprisingly safe option. After this small detour, we finally made it to Oregon the next morning which you can read about in Part II of our PCH Road Trip blog series.